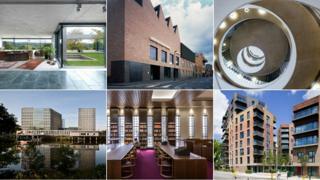 Six new buildings are in the running for this year's Riba Stirling Prize for architecture. A select line-up of judges will decide the winner, but the BBC, in partnership with Riba, is inviting you to vote for your favourite. Watch films about all the buildings here. The UK's most prestigious prize for new buildings, the Riba Stirling Prize, will be awarded on 6 October. While a select line-up of judges will decide the winner, the BBC, in partnership with Riba, is inviting readers to vote for their favourite. If you are viewing this page in the BBC News app, tap here to vote.